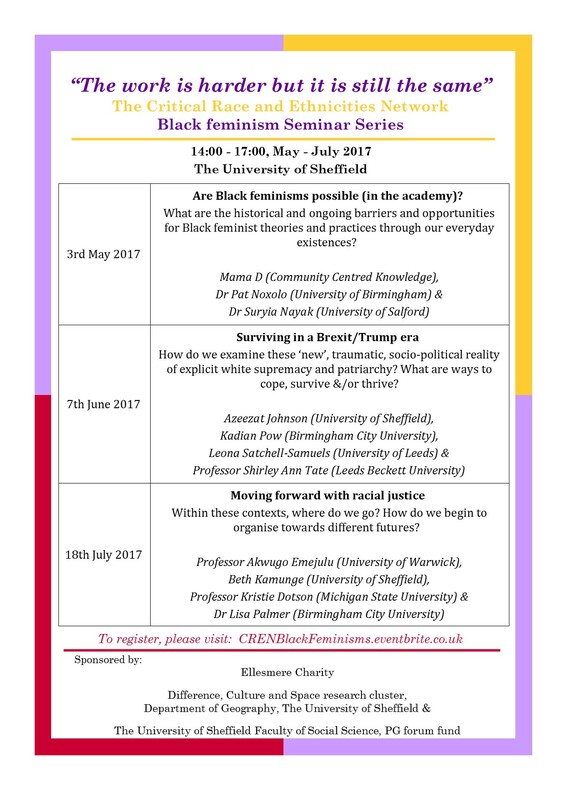 To signal the end of CREN, we will be hosting a 3 part Black feminism series. Given our motivations behind setting up CREN, it seemed only appropriate that we used this opportunity to discuss the ongoing relevance of Black feminism with intellectuals that we have long admired. The series title refers to the Combahee River Collective and the response by the Black Lives Matter movement following the Trump victory. Given the explicit (rather than implicit) racial violence that we are facing, we hope to use these three seminars to reflect on the where we’ve been, what we’re currently facing, and where we can potentially go. Faculty of Social Science, PG forum fund.